Michigan State University took first place overall at the 40th annual National Collegiate Landscape Competition. Mid-March is spring break for college students across the country. For many, that meant a week at mom and dad’s house, binge watching Netflix, or a trip somewhere warm, binging on something else. 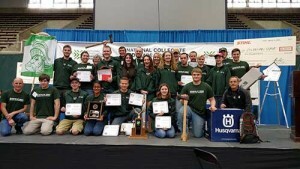 But for 850 horticulture students on 65 teams, spring break meant testing their skills at the National Collegiate Landscape Competition (NCLC), hosted by the National Association of Landscape Professionals (NALP). The 40th annual event—formerly known as Student Career Days—was held March 16-19 in Starkville, Miss., the home of Mississippi State University and the site of the first NCLC in 1977. Team members competed in 28 individual and partner events, such as irrigation assembly, exterior landscape design and small engine repair. The team garnering the most points from the individual events won a $5,000 prize for their horticulture club. 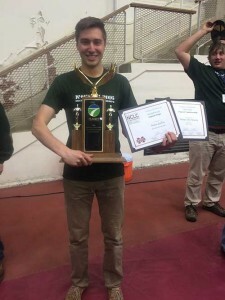 This year’s winner was the Student Horticulture Association from Michigan State University, which had strong showings in the irrigation categories, turf and weed identification and small engine repair. Brigham Young University—Idaho was the first runner-up and Cuyahoga Community College (Ohio) took third place. The top scoring individual student was Anna Cordiner of Colorado State University. Ben Harcey from Michigan State University was the individual runner-up, and Matthew Case from Alamance Community College took third. Preston Zoellner, a junior studying horticulture, is a member of the Michigan State University Horticulture Association. After finishing a heartbreaking second last year, MSU took first place overall for the first time in the history of the event. Preston Zoellner won the irrigation troubleshooting event for the second year in a row. Zoellner contributed to his team’s win with a first place finish in irrigation troubleshooting, along with his partner Harcey, and a second place finish in irrigation design. His individual accomplishments and the team’s win, he said, are the culmination of his and his teammates’ many hours of hard work. While outsiders might only see two days, Zoellner and MSU’s accomplishments were months in the making. Since November, each team member studied event-specific instructional videos, read informational packets and tinkered with relevant equipment—pipe fittings and sprinkler heads in Zoellner’s case. In addition to required school work, Zoellner spent three or four hours per week preparing for the competition, he said. The team worked hard to get to Starkville, too. Each year, the MSU Horticulture Association hosts a one-day Spring Sale, where the group sells plants it grows. This year, the group raised $40,000. The fundraiser paid for the entry fee, the hotel and the bus. And Zoellner is just one student. More than 850 student competitors showing similar dedication and passion piqued excitement among the green industry professionals in attendance. While it was Brett Lemcke’s first NCLC as president of NALP, it was not his first time in attendance. Addressing the students during the opening ceremony, Lemcke reminded the crowd that he too competed in NCLC as a student at SUNY Cobbleskill. He said the event gave him a scale of how much the industry had to offer and how high the bar could be set. 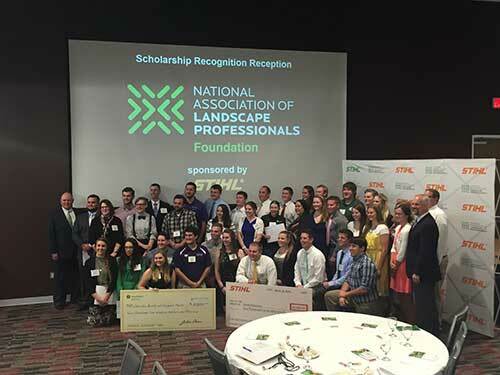 Rodger Phelps of Stihl poses for a picture with the 53 Foundation Scholarship recipients. Stihl sponsored the event. In addition to the competitive events, NCLC also featured a career fair, workshops and the Foundation Scholarship Program. Students attended workshops on environmental sustainability, small engine repair, estimating and more. Tyler Gilson, a competitor in the 3D exterior design competition for Michigan State, attended the 3D exterior landscape design workshop hosted by Vectorworks, and the computer aided landscape design workshop hosted by Dynascape. The event also featured the Foundation Scholarship Ceremony, where 53 students earned scholarships. Green industry companies and professionals sponsored each student scholarship and spent time fielding questions about the industry and mentoring the students. Stihl has been a founding ambassador of the Foundation Scholarship program for more than 20 years. Phelps, who hosted the event, said he hoped the recipients took advantage of the wealth of knowledge that surrounded them at the event. The career fair was another highlight of the week. More than 50 companies set up booths and met student job seekers. Many companies weren’t seeking specific skill sets but the sense of professionalism and drive that brought these students to Starkville in the first place.